Alexander Milne Cordiner also went by the name of Alex. He was born on 28 April 1925 in 7 North Square, Aberdeen, Scotland. He was the son of Alexander Milne Cordiner and Jane Forbes Morrice. Alexander Milne Cordiner was a tea planter on 27 August 1960. He married Olive Monica Stock, daughter of Stephen Rankin Stock and Olive May Cornick, on 27 August 1960 in Catholic Church of the Sacred Heart and St Ia Virgin, Tregenna Hill, St. Ives, Cornwall. Alexander Milne Cordiner died on 13 September 2011 in Aberdeen, Scotland, at age 86. Alexander Milne Cordiner was a fish merchant. He married Jane Forbes Morrice on 1 August 1924. Frederick Vernon Corkill was an mechanical engineer. He married Adeline Mary Walton. Vera May Hunt was a laundress. She was born before 27 August 1895 in Mount Cotton, Queensland, Australia. She was the daughter of Frederick Vernon Corkill and Adeline Mary Walton. Vera May Corkill lived in North Sydney, New South Wales, Australia, on 27 November 1920. She married Oscar Owen Hunt, son of Percy Alexander Hunt and Emily Harriet Youngman, on 27 November 1920 in St Thomas' Church, North Sydney, New South Wales, Australia. As of 27 November 1920 her married name was Hunt. Vera May Hunt lived in 3/5 Ocean Street, Woollahra, Sydney, New South Wales, Australia, on 26 August 1973. She died on 26 August 1973 in St Vincent's Hospital, Darlinghurst, Sydney, New South Wales, Australia. Vera died of myocardial ischaemia (2 hours), coronary artery sclerosis (8 months) and coronary infarct (2 years). She was cremated on 30 August 1973 in Eastern Suburbs Crematorium, Sydney, New South Wales, Australia. Norman Bremner Corlett was born circa May 1901 in Lancashire. He married Joan Watson, daughter of George Trustram Watson and Dorothy Nora Rankin, circa May 1929 in Kent. Norman Bremner Corlett died circa August 1946 in Wirral, Cheshire. Elizabeth Bessie Cornick was a cook (domestic servant). She lived in 1 Mary Street, Yeovil, Somerset, on 22 May 1902. Elizabeth was recorded in the census of 2 April 1911 living in Longburton, Sherborne, Dorset. She was enumerated as Elizabeth Bessie Smith, wife of Alfred Edward Smith, age 30, married under one year, born in Hilfield, Dorset. Olive May Stock was a milliner, formerly a housemaid. She was born on 22 May 1902 in Hollands, Yeovil, Somerset. She was the daughter of Elizabeth Bessie Cornick. Olive was recorded in the census of 2 April 1911 living in Longburton, Sherborne, Dorset. She was enumerated as Olive May Cornick, step daughter of Alfred Edward Smith, age 8, scholar, born in Yeovil, Somerset. She was a housemaid (domestic) on 30 September 1925 in Grove House, Yailford, Salisbury. She married Stephen Rankin Stock, son of Claude Bernard Stock and Ethel Phoebe Stock, on 30 September 1925 in St. Osmond's Roman Catholic Church, Salisbury, Wiltshire. As of 30 September 1925 her married name was Stock. Olive May Stock and Stephen Rankin Stock lived in 3A Mount Pleasant, Hayle, Cornwall, on 27 August 1960. Olive May Stock lived in Westcliff House, Logan Road, Bristol, on 5 September 1983. 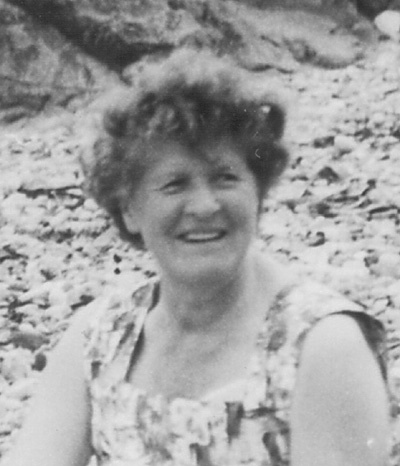 She died on 5 September 1983 in The Hospital, Thornbury, Avon, at age 81. Olive died of cerebrovascular accident & hypertension. Evelyn Cornock was born before 1 April 1866 in Berkeley, Gloucestershire. She married Arthur Wellington Perry circa February 1892 in Thornbury, Gloucestershire. As of circa February 1892 her married name was Perry. Evelyn was recorded in the census of 31 March 1901 living in Bellevue, Barrows Road, Cheddar, Somerset. She was enumerated as Evelyn Perry, daughter in law of Thomas J Perry, married, age 35, born in Berkeley, Gloucestershire. Evelyn was recorded in the census of 2 April 1911 living in The Barrows, Cheddar, Somerset. She was enumerated as Evelyn Perry, daughter in law of Thomas J Perry, age 45, married 19 years, 2 children still living, born in Berkeley, Gloucestershire, British nationality. Raymond Coughlan was born before 20 March 1927 in Goulburn, New South Wales, Australia. He was the son of Carl Laurence Coughlan and Rose Alma Kelly. Raymond Coughlan and Edith Rosa Hunt lived in 50 Douglas Street, Stockton, Newcastle, New South Wales, Australia, on 19 March 1949. Raymond Coughlan was a omnibus conductor on 19 March 1949. He married Edith Rosa Hunt, daughter of Eric George Hunt and Janet Rudkin, on 19 March 1949 in Church of St Paul, Stockton, Newcastle, New South Wales, Australia. Raymond Coughlan died before 29 June 2005. Alfred Cowie was born circa February 1860 in Woodchurch, Cheshire. He was the son of Charles George Cowie and Margaret Blackwood Cuthbertson. Alfred was recorded in the census of 7 April 1861 living in Woodchurch Road, Oxton, Birkenhead, Cheshire. He was enumerated as Alfred Cowie, son of Charles G Cowie, age 1, born in Woodchurch, Cheshire. Alfred Howard Cowie was born on 7 November 1830 in Hull, Yorkshire. He was the son of John Cowie and Sarah Stock. Alfred was recorded in the census of 30 March 1851 living in Kensington, West Derby, Liverpool, Lancashire. He was enumerated as Alfred Cowie, son of Sarah Cowie, unmarried, age 20, cotton broker's clerk, born in Hull, Yorkshire. He lived in Blackburn Terrace, Claughton, Birkenhead, Cheshire, on 21 January 1857. He was a cotton broker on 21 January 1857. He married Marion Elizabeth Cairns, daughter of Alexander Cairns, on 21 January 1857 in Union Chapel, Oxford Road, Chorlton upon Medlock, Manchester, Lancashire. Alfred was recorded in the census of 7 April 1861 living in 35 Grange Mount, Birkenhead, Cheshire. He was enumerated as Alfred H Cowie, head of household, married, age 30, cotton broker, born in Hull, Yorkshire. Alfred was recorded in the census of 2 April 1871 living in Brookfield, Eastham, Cheshire. He was enumerated as Alfred H Cowie, head of household, married, age 40, cotton broker, born in Hull, Yorkshire. Alfred was recorded in the census of 3 April 1881 living in 8 Westminster Road, Claughton, Birkenhead, Cheshire. He was enumerated as Alfred H Cowie, head of household, married, age 50, cotton broker, born in Hull, Yorkshire. Alfred was recorded in the census of 5 April 1891 living in 23 Devonshire Place, Claughton, Birkenhead, Cheshire. He was enumerated as Alfred H Cowie, head of household, married, age 60, insurance broker & general commission agent, employer, born in Hull, Yorkshire. He was the official informant of the death of Sarah Elizabeth Sutherland on 13 September 1895 in Oakleigh, Alleyn Park, Dulwich, London. Alfred was recorded in the census of 31 March 1901 living in 7 Blandford Street, Claughton, Birkenhead, Cheshire. He was enumerated as Alfred H Cowie, head of household, married, age 70, commission agent, own account, born in Hull, Yorkshire. He died on 13 March 1902 in 7 Blandford Street, Birkenhead, at age 71. Alfred died of pneumonia (2 days). Alfred Howard Cowie was born on 8 January 1867 in Mann Hill, Birkenhead, Cheshire. He was the son of Alfred Howard Cowie and Marion Elizabeth Cairns. Alfred was recorded in the census of 2 April 1871 living in Hooton Farm, Hooton, Cheshire. He was enumerated as Alfred H Cowie, visitor to George Hill (physician & surgeon), age 4, born in Birkenhead, Cheshire. He died on 1 May 1871 in Southport, Lancashire, at age 4. Alfred William Cowie was born in 1856 in Norwood, Adelaide, South Australia, Australia. He was the son of Henry Cowie and Ruth Hutchinson. Annie Elizabeth Cowie was born circa May 1849 in Tranmere, Birkenhead, Cheshire. She was the daughter of Henry Cowie and Ruth Hutchinson. Annie was recorded in the census of 30 March 1851 living in Fir Grove, Claughton, Birkenhead, Cheshire. She was enumerated as Annie Cowie, daughter of Henry Cowie, age 1, born in Tranmere, Cheshire. Bethia Caroline Cowie was born circa August 1854 in Woodchurch, Cheshire. She was the daughter of Charles George Cowie and Margaret Blackwood Cuthbertson. Bethia was recorded in the census of 7 April 1861 living in Woodchurch Road, Oxton, Birkenhead, Cheshire. She was enumerated as B Caroline Cowie, daughter of Charles G Cowie, age 6, scholar, born in Woodchurch, Cheshire. She witnessed the marriage of George Hastwell Grayson and Marion Elizabeth Cowie on 3 July 1902 in Parish Church, Bidston, Cheshire. Caroline Cowie was born on 2 January 1822 in Hull, Yorkshire. She was the daughter of John Cowie and Sarah Stock. Caroline Cowie was christened on 27 June 1822 in Fish Street Independent Chapel, Kingston upon Hull, Yorkshire. She died on 7 February 1823 in Kingston upon Hull, Yorkshire, at age 1. Charles George Cowie was a merchant and ship owner. He was born on 24 August 1812 in Compton Terrace, Islington, Middlesex. He was the son of John Cowie and Sarah Stock. Charles George Cowie was christened on 23 September 1812. He witnessed the marriage of John Sutherland and Sarah Elizabeth Cowie on 28 September 1839 in Holy Trinity Church, Church Road, Wavertree, Liverpool, Lancashire. Charles George Cowie was the official informant of the death of John Cowie on 6 March 1842 in 10 Bedford Street North, Liverpool, Lancashire. Charles George Cowie lived in 40 Soho Street, Liverpool, Lancashire, on 6 March 1842. He married Margaret Blackwood Cuthbertson on 26 April 1843. Charles George Cowie witnessed the marriage of Alfred Howard Cowie and Marion Elizabeth Cairns on 21 January 1857 in Union Chapel, Oxford Road, Chorlton upon Medlock, Manchester, Lancashire. Charles was recorded in the census of 7 April 1861 living in Woodchurch Road, Oxton, Birkenhead, Cheshire. He was enumerated as Charles G Cowie, head of household, married, age 48, merchant, born in London, Middlesex. He was a ship owner on 3 April 1864. He died on 15 December 1866 in Wyke House, Isleworth, Middlesex, at age 54. Charles died of general paralysis (2 years). He was buried in Woodchurch, Birkenhead, Cheshire. Charles George Cowie was born circa May 1847 in Liverpool, Lancashire. He was the son of Charles George Cowie and Margaret Blackwood Cuthbertson. Charles was recorded in the census of 7 April 1861 living in Woodchurch Road, Oxton, Birkenhead, Cheshire. He was enumerated as Charles G Cowie, son of Charles G Cowie, age 13, scholar, born in Liverpool, Lancashire. He was the official informant of the death of Margaret Blackwood Cuthbertson on 7 September 1866 in Woodchurch Road, Birkenhead. Charles George Cowie lived in Woodchurch Road, Birkenhead, on 7 September 1866. David Cowie was born on 30 September 1824 in Hull, Yorkshire. He was the son of John Cowie and Sarah Stock. David Cowie was christened on 11 January 1825 in Fish Street Independent Chapel, Kingston upon Hull, Yorkshire. He died in 1867 in Mauritius. Emmeline Cowie was born on 20 January 1820 in Hull, Yorkshire. She was the daughter of John Cowie and Sarah Stock. Emmeline Cowie was christened on 23 March 1820 in Fish Street Independent Chapel, Kingston upon Hull, Yorkshire. Emmeline was recorded in the census of 6 June 1841 living in Castle Gate, Nottingham. She was enumerated as Emeline Cowie, age 20, female servant, not born in Nottinghamshire. Emmeline was recorded in the census of 30 March 1851 living in Lichfield Street, Castle Church, Staffordshire. She was enumerated as Emmeline Cowie, sister of Frederic Osborne Cowie, unmarried, age 31, born in Kingston upon Hull. She witnessed the marriage of Alfred Howard Cowie and Marion Elizabeth Cairns on 21 January 1857 in Union Chapel, Oxford Road, Chorlton upon Medlock, Manchester, Lancashire. Emmeline was recorded in the census of 7 April 1861 living in 3 Euston Grove, Birkenhead, Cheshire. She was enumerated as Emmeline Cowie, daughter of Sarah Cowie, unmarried, age 41, retired, born in Hull, Yorkshire. Emmeline was recorded in the census of 2 April 1871 living in 12 Lord Street, North Meols, Southport, Lancashire. She was enumerated as Emmeline Cowie, lodger with Harriet Chapman, unmarried, age 51, annuitant, born in Hull, Yorkshire. Emmeline was recorded in the census of 3 April 1881 living in 2 Caroline Place, Claughton, Birkenhead, Cheshire. She was enumerated as Emmeline Cowie, head of household, unmarried, age 61, annuitant, born in Hull, Yorkshire. Emmeline was recorded in the census of 5 April 1891 living in 2 Beresford Road, Oxton, Birkenhead, Cheshire. She was enumerated as Emmeline Cowie, head of household, single, age 71, living on her own means, born in Hull, Yorkshire. Emmeline was recorded in the census of 31 March 1901 living in 2 Beresford Road, Birkenhead. She was enumerated as Emmeline Cowie, head of household, single, age 81, born in Hull, Yorkshire. She died circa February 1903 in Birkenhead, Cheshire.